Choose any of the three engines, and you’re choosing a winner. The powerfully efficient 2.5L I-4 is standard, or there’s the advanced 3.6L V6 with the most horsepower of any midsize pickup. And don’t forget the available GM-exclusive Duramax® 2.8L Turbo-Diesel. 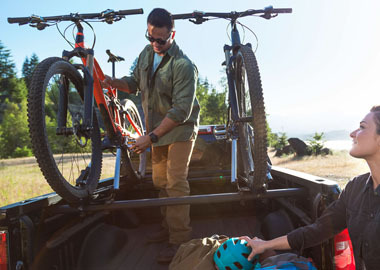 Tailor your Colorado around your unique lifestyle with dozens of accessories, from bike carriers to utility racks. Whatever your passion, this midsize truck helps you pursue it. Providing available best-in-class horsepower and towing, Colorado offers advanced 2.5L I-4 and 3.6L V6 engines in addition to the available Duramax® 2.8L Turbo-Diesel. Whichever engine you choose, impressive performance and efficiency ride shotgun on every trip. An available GM-exclusive Duramax® 2.8L Turbo-Diesel engine offers best-in-class towing power and torque, and makes Colorado America’s most fuel-efficient pickup. 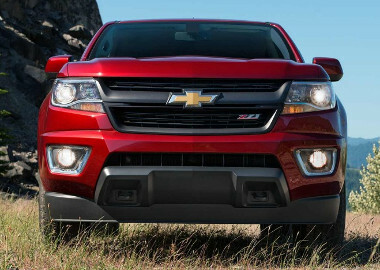 When it comes to midsize pickup truck engines, this one goes right to the front of the class. 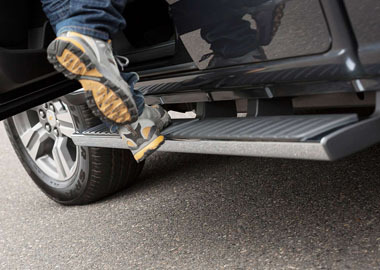 Colorado features available 5" rectangular chrome step bars for easy entry and exit. Colorado is designed to perform seamlessly from city streets to camping retreats. The available GearOn™ storage system brings incredible utility with two-tier loading and a bed divider to help secure and store your gear. A quiet, refined interior combines luxury and convenience into a single package. Colorado Z71 shown in Red Rock Metallic with unique Z71 Gunmetal grille. Intuitive gauges and controls allow for easy operation. Both available leather-appointed and standard cloth seats provide great support and ample front and rear legroom. Colorado features inlaid triple-sealed doors, thick windshield and side glass, and liquid-applied sound deadener to help keep outside noise out and the music on the available Bose® sound system sounding that much better. In fact, there’s no quieter midsize truck on the road today. Colorado is one smart midsize truck, offering technology to keep you connected like available 4G LTE Wi-Fi® and Chevrolet MyLink with a 7- or 8-inch diagonal color touch-screen display. Standard on every Colorado, Teen Driver technology has a number of features, from muting the audio until front-seat occupants are buckled, to automatically turning on certain available advanced safety technologies, if equipped. An in-vehicle report card shows how your teen performed so you can coach your new driver on improvements. Colorado offers ingenious active safety technologies like a standard rear vision camera, available Forward Collision Alert, and Lane Departure Warning to help prevent collisions before they happen, providing added peace of mind as you focus on your drive.